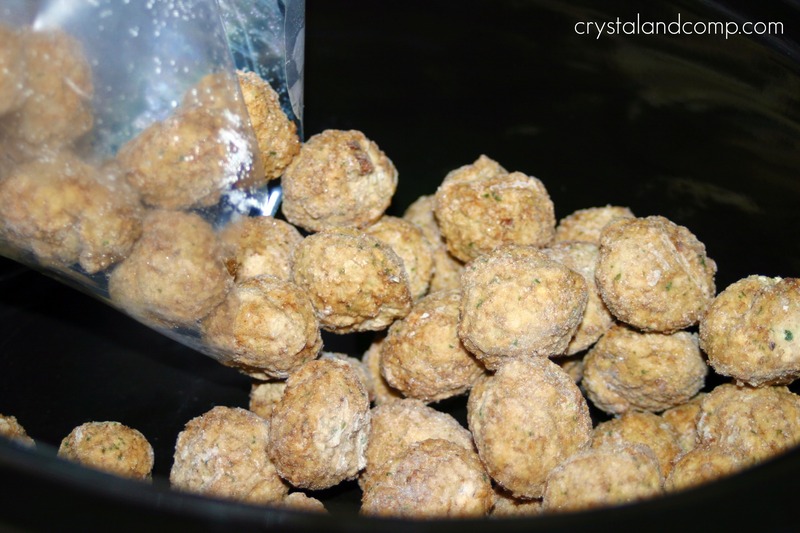 Dump your frozen meatballs into the crockpot. Pour the spaghetti sauce over the meatballs. I like to get every last bit of sauce out of the jar and thin the sauce down a tad, so I add a little water to the empty jar and slosh it around. I then pour the watery remnants into the crockpot. This cooks pretty quickly. On the high setting it is certainly done in 4 hours (maybe quicker depending on your crockpot). Or, cook on low for about 6 hours. 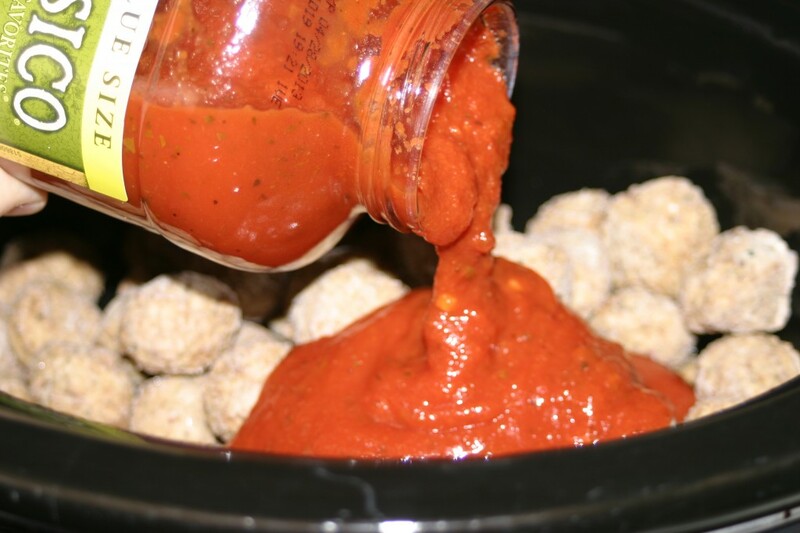 If it is done before you are ready to serve it, just put it on warm if your crockpot has that option. About 20 minutes before you are ready to serve, boil your spaghetti noddles on the stove according to the package directions. 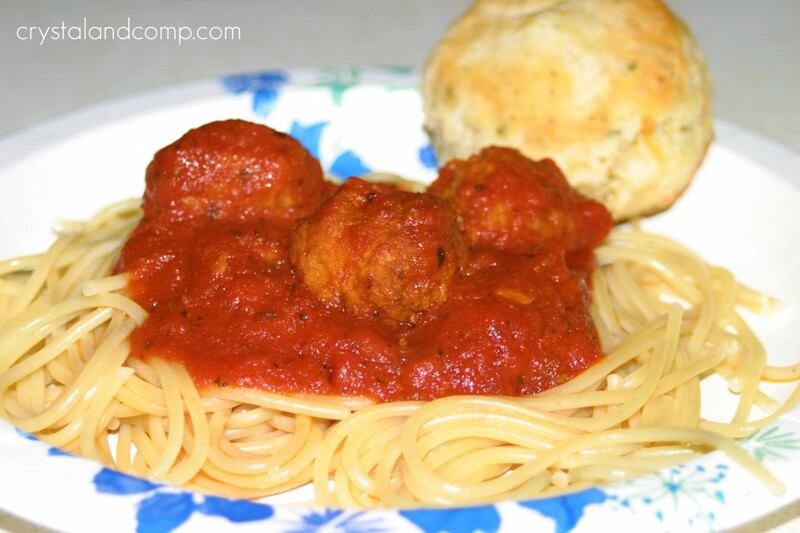 Plate it up and serve the spaghetti and meatballs over the noodles. And that spaghetti jar? Re-purpose it into a vase as I did in this tutorial. Perfect meal for a busy night. This is simple and requires minimal work. 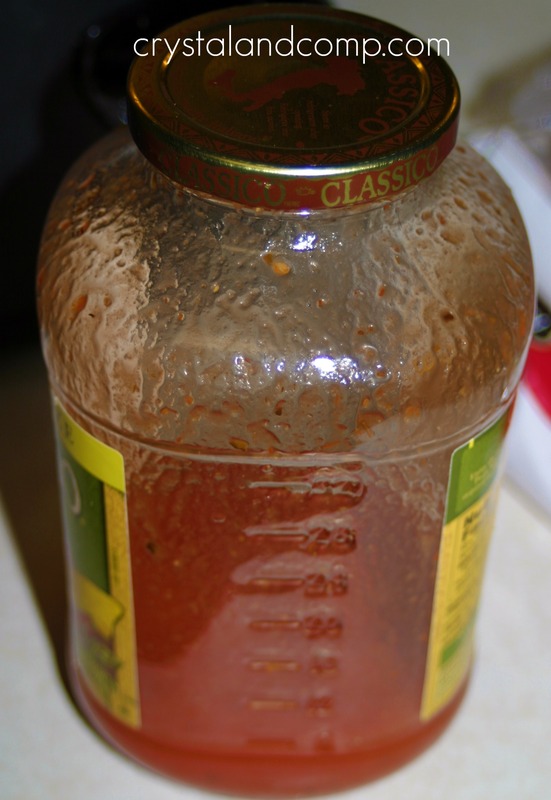 I like to get every last bit out of the jar and thin the sauce down and bit, so I add a little water to the empty jar and slosh it around. Then pour the watery remnants into the crockpot. This cooks pretty quickly. On the high setting it is certainly done in 4 hours (maybe quicker depending on your crockpot). Or, cook on low for about 6 hours. If it is done before you are ready to serve it, just put it on warm if your crockpot has that option. About 20 minutes before you are ready to serve, boil your spaghetti noddles on the stove according to the package directions. .
Angie- I am a crockpot-a-holic! Such a great and simple idea. I could see doing the same thing with meatball subs instead to shave off even more time. Thanks for the great idea! Kelly, I was thinking the same thing- meatball subs! Thanks for another recipe – and thanks for the printer friendly version. Awesome…have been planning to try this dish since long. I’ve been looking for easy recipes. You’d think having the summer off, I would cook more. Oh well. I’ve never made this in a crock pot before, I’ll have to try that. Thanks for sharing! Thanks for sharing this. It looks perfect for those days I have to work later. I’ll be joining you all next Thursday at Running with Glitter. I’m on a mission! Wow! So simple and so perfect for my life! I’m always looking for crockpot ideas to help with more nutritious dinners. I don’t think McD’s drive through several times a week will win me mother of the year 🙂 Thank you for posting this to “Just Something I Whipped Up”. how wonderfully delicious and simple! Thanks for linking! You rock! This is exactly what I was looking for! And the idea to prepare it for meatball subs is a terrific idea! Thank you! What a great choice to make the delicious spaghetti in quickest way.How about using bbq sauce, can it be able to replace the spaghetti sauce in this recipe?